Let’s talk about how to save on produce, shall we? You’ve probably heard the most common one of buying in-season, but how do you know when produce is in season? And what are some other ways you can save on produce? 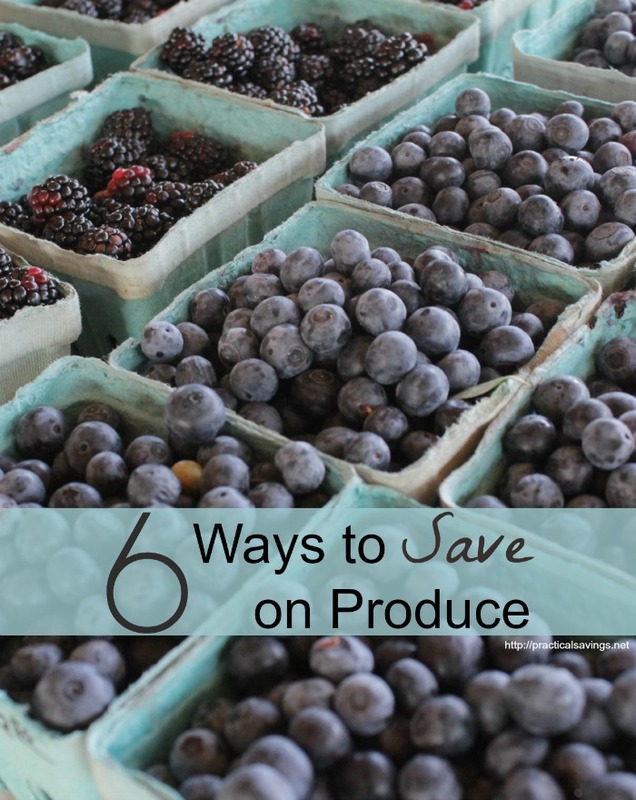 Here are the top 6 ways to save on produce. Do you live in California or New York? Growing seasons will vary from state to state so know your area. Hit some of your local farmer’s markets and see what they are selling and when. Make notes in a notebook so you can refer back to it later on. If you have a smartphone, there are apps available that can help, but I haven’t found a free one yet. In-season produce will be cheaper. In the same notebook, keep track of prices on your favorite go-to vegetables and fruits (I don’t recommend tracking all the produce in your stores/farmer’s markets, that would become overwhelming). This will help you decide what your price limit will be (see point 5). Sometimes you can get an even better deal on in-season produce if you buy bulk quanties. You might be scared to buy 50 pounds of potatoes or 25 pounds of oranges but consider making that your only produce purchase for the next couple weeks (especially if it’s a fruit item) or maybe it’s something you can preserve by freezing, drying or canning part of the purchase. If it’s in the winter and cold where you are, consider putting it outside in a covered area or in a room you can keep cold. It will help many things last longer. Try to buy local. I realize buying local isn’t always an option, especially if you’re looking for a certain vegetable or fruit that isn’t even grown in your area. However, if there is certain produce that grows well in your area, your money will most likely go further buying that locally grown produce than something more exotic at the store. I’ve set my maximum price per pound that I will pay. If apples go over $0.99 per pound, I won’t buy them. The price per pound will obviously be determined by the produce item, but I try to make such sure any produce I purchase does not exceed the $0.99 per pound mark. Certain items, I won’t pay over $0.79 per pound or even lower for things like zucchini and squash. When it comes right down to it, growing your own can save you a lot of money on your produce budget. However, take into account region, soil preparation, upkeep and cost of watering. Our soil is poor and would take an investment to make it better. Our gardens have produced very small amounts and we’ve spent way more in watering then we saved. We’ve had to change our gardening plans several times but hope to add small raised beds over time instead of tackling our whole yard at once. What are some ways that you save on your grocery budget when it comes to produce?